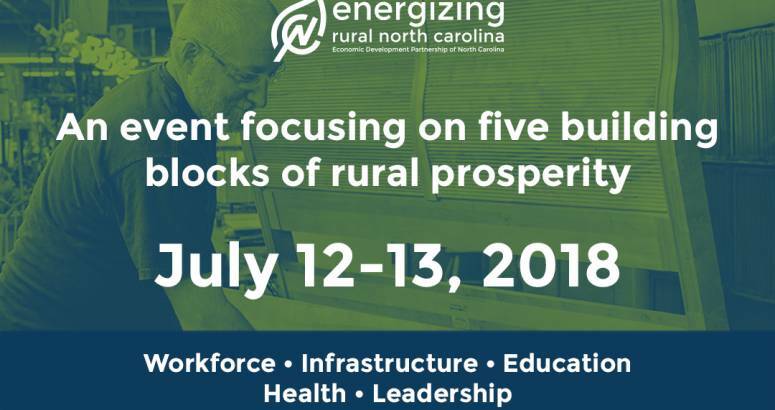 Local economic developers from every county in the state have invitations in-hand for the event “Energizing Rural North Carolina: The Building Blocks of Successful Economic Development,” to be held July 12-13 at The Carolina Hotel in Pinehurst. Now it’s just a matter of invitees confirming they want to join leadership from across the state at the gathering where expert speakers and case studies will illustrate how five pillars of prosperity ‒ infrastructure, workforce, education, health and leadership ‒ can shape successful rural economic development. If you have your invitation from Christopher Chung, chief executive officer of the Economic Development Partnership of North Carolina (EDPNC), and have not yet responded, perhaps you have a few questions. EDPNC Events Manager Kelly Dawson can answer them. Email her at Kelly.Dawson@edpnc.com, or call her at 919-447-7789. For more information, visit the event website here. The EDPNC is presenting the event in partnership with the Golden LEAF Foundation, NC Rural Center, North Carolina Economic Development Association, North Carolina Department of Commerce and NC State University Institute of Emerging Issues.